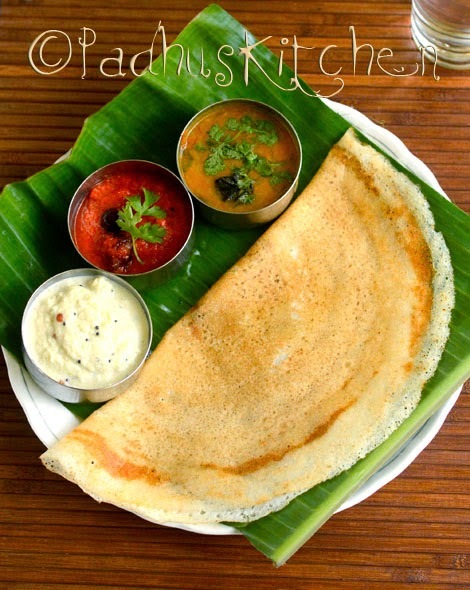 Dosa is a South Indian crepe made from rice and lentils. It is rich in carbohydrates and protein and is usually prepared for breakfast or dinner. It is served with sambhar or chutney. Dosa is a favourite among kids. If I ask my kids whether they want idly or dosa, their choice is always dosa. 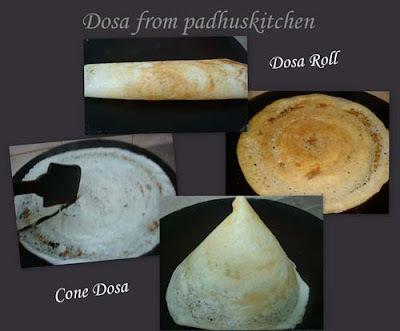 There are a number of varieties of dosa but before going to all that I wanted to give the basic dosa recipe. It is long since I posted anything in my "how to series" for budding cooks. You can prepare both Idly and dosa, if you are using Dosa #1 and dosa #2 measurements. Salt - 1 1/2 tbsp ( I use crystal salt). Use less if you are using table salt. Adjust salt as required. With this Dosa Batter Recipe #3 you can prepare only dosa. Wash and soak both rice and dal for 5 - 6 hours separately. Soak fenugreek seeds along with urad dal. Drain the water and grind dal in a wet grinder or food processor adding water from time to time to a smooth and fluffy batter. Remove it in a container. Grind rice to a slightly coarse paste adding water little at a time. Mix both the ground rice and dal together with clean hands or a ladle. The consistency of the batter should not be too thick nor too thin but should thickly coat a spoon when dipped in the batter. Add salt and leave it overnight or for 7-8 hours for fermentation. The fermenting time differs depending on the temperature and weather conditions. After fermenting the batter will double its volume. So place the batter in a large container. This fermented batter is used to make dosa. Now your dosa batter is ready. Mix it well with a ladle. Take a ladle of batter, pour it in the centre of the tawa and spread it a circular motion. If you want paper thin dosas, dip the spatula in water and flatten the dosa evenly ( See pic 2) as shown in the picture. When the corners start lifting up, flip the dosa to the other side, drizzle 1/2 tsp of oil and cook until done. Serve with sambar or chutney or milagai podi mixed with oil. It can be served in different ways- rolled, folded or made it into a cone (picture above). It can be made thin and crispy or thick and spongy like uthappams, or super thin (known as paper dosas). Repeat the same process for the rest of the batter. Enjoy making the most popular South Indian Breakfast at home!! Refer delicious Chutney Recipes and Sambar Recipes and more side dishes for idli-dosas. lovely dosas - can I have 1 ? 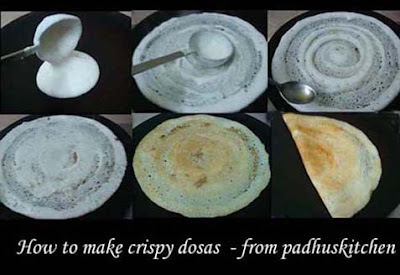 Very nicely explained and shown through those pics....very useful post for the beginners..
My family love dosa, must try to make this. Thank you for sharing this recipe. Nice post, you have explained how to do it well. I'd love to try this! Hi. Very nicely explained Padhu, it will be of great help for the beginners. Personally I like cone dosa. Oh, they look so tasty and perfect! I wish I had a grinder! Thanks for dropping by my blog and leaving lovely comments. great post! and a nice start to a recipe-filled 2010! Love this post very much. Dosa procedure explained very well. Good job dear. Wish you and family a happy n prosperous new year. Yummy dosa with nice presentation. Wish yo & your family a very happy new year.. The dosa looks perfect.. I was already for it since friday..seeing ur pic makes me crame more !!! Lovely dosa and a perfect way of explaining the making of it. Very useful for novice cookers...lovely clicks!! wow, Dosai is my fav!!.. I can eat it all day! !, nice dosai's :), wish you and your family a very very happy new year!! Lovely presentation... they look perfect. My family's fav. Dear Padhu, Your Dosas look perfect. Nice and crispy, just the way I like. I have nominated you for a Kreativ blogger award as one of my favorite blogs. Please come visit my blog and see how it works and pick up your award. Thank you. Hey Padhu, thanks for the lovely elaborate post and especially the Onion tip. Will do it the next time I prepare dosas. Wish you a happy new year! i love dosai, i have a tawa and now your recipe, i'll give it a try! Which raw rice do u use? Can I use basmati rice? or shd i use something else? Thanks for the great dosa recipe! I had my first dosa at a local restaurant and really like the texture and flavor. Cheers! hello padhu... can u tell me what is idly rice in telugu plss? You prepare the dosa batter just like my Mother does. I miss her Dosa. Hi Padhu, thanks for the recipe. It look great. I've tried it, but somehow my batter didn't fermented nicely and when cook it turn hard. Aseah Othman- If the batter does not ferment well, then your dosa will be hard. So it is very important that you ferment the batter well before making dosas. hi padhu... i too using d same procedure but i m nt getting tat crispiness n my dosa...dnt knw y?... :-( cud u plz suggest me...wat 2 do? and my idly batterand hotel dosa batter recipe. Thank you for liking my recipes. You can try using sona masori rice. You can add 1/4 cup of poha for softness. My dosa bcums like rubber.. I have tried #3 several times and when I cook the dosa it won't cook. I have tried idli dishes, a skillet and I've cooked it for a long time hoping it would finally cook and it's completely raw and inedible. Do you know what I'm doing wrong? Use good quality and fresh ingredients. Do not stock urad dal. Grinding the batter well is also important. When cooking dosa, cook on medium heat and wait for the corners to lift up, then flip it over to the other side. Thanks for the recipe padhu..
For dosa batter, you can also grind rice and dal together or separately. Is it possible to make instant dosa powder? Store it and add water whenever you want dosa? Will it work? There is a difference when using the third method. I will try today itself. I will choose the third method. For the 1st and 2nd measurements, can I use ponni rice?